The chemical modifications of castor oil (CO) to develop branched polyols and their polyurethane-urea coatings have been investigated. For this purpose, castor oil-based branched polyols (COBPs) were synthesized from CO by modifying with succinic anhydride followed by reaction with hydroxyl group moieties like petrochemical-based pentaerythritol, trimethylolpropane and bio-based glycerol. The COBPs were characterized by using Fourier transform infrared, 1H and 13C nuclear magnetic resonance spectroscopies, gel permeation chromatography and differential scanning calorimetry. These COBPs were further urethanized with isophorone diisocyanate at OH/NCO ratio of 1:1.6 to get the isocyanate-terminated polyurethane prepolymers. The surplus isocyanate groups of the prepolymer were cured with atmospheric moisture at ambient temperature condition to form uniform film with fast surface drying. The thermo-mechanical, viscoelastic and swelling properties were evaluated for the cured coating films. Properties have been discussed from the viewpoint of branched network and also the urethane segment present in the structure. The glass transition temperatures of the coating films were found to be in the range of 32–64°C. 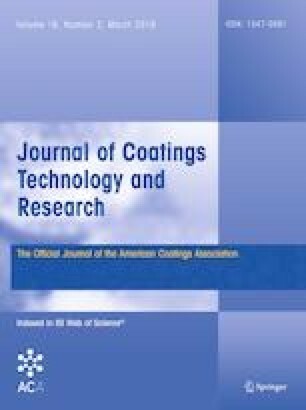 The modified castor oil coating films show better thermo-mechanical and viscoelastic properties in comparison with control (unmodified castor oil) coating films. This work delivers an effective and promising way to synthesize branched moieties in plant oil-based high performance coatings. Authors would like to thank Asian Paints staffs for their support in characterization, and the authors also thank V. P. Technology and Asian Paints management for publication.